Did this mission in a fleet of 2 Ravens with 6 Cruise & 2 LST and only light tank for maxed cap and 1 passive Drake as main tank (2 LSE, 4 passive resistance amps), was pretty easy. Next time we try with 2 ships. I'm not sure what i killed in between warpin and completion, but i never killed a single manslayer. all 12 were still ther un-touched when i warped out after salvaging. Updated mission report to indicate that in the tips. Confirmed Manslayers did not have to be destroyed. I got the mission complete with 3 butchers left and no manslayers destroyed. It seems I've found a new way to Blitz this mission. 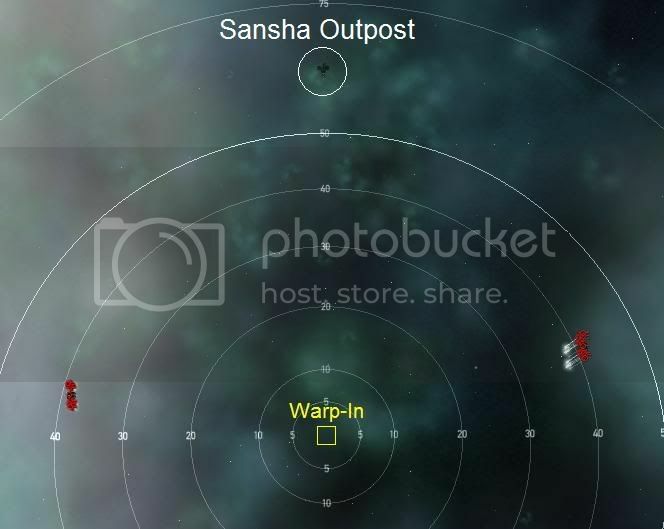 I destroyed the Sansha Outpost and the ships it spawns. 3 BS and 4 BC. After killing the last BS mission was complete. Damage numbers arent quite accurate. Centus Tyrants launch kinetic damage cruise missiles. nice mission, easy to solo in about 20mins. My blitz was the same as TanteErna and GeneN but i also had 3 centior horrors (frigs) in the respawn. Completed when whole outpost respawn group destroyed. Same as TanteErna, Solo with passive Rattlesnake, 2x Tech II EM/2x Pithum A-Type Thermal. Solo'd with passive Rattlesnake as XoNe, but T2 therm instead of A-Type. Outpost + Outpost spawn did NOT trigger completion. Didn't touch the manslayers. I had to kill all the butchers and the horror frigs. Took out the butchers and all their spawns first, but triggered completion when the last horror popped. Next time I'll try the horrors first. As I re-read the other comments, I can't help but wonder if the horrors spawned with the outpost. Update: Since the Incarna patch, this mission is no longer identical to Sansha on the Horizon, at least in terms of completion requirements (kill station and station spawn). Now, it's a little more busy. You have to kill the station, which has a lot more hp now, the ships from all three station spawns and all the butcher frigs. As you pop the butchers, there are multiple spawns, but they can be ignored if you can tank them. I'm ashamed to admit it takes about 20 minutes to solo this "blitz" with a thanny, though I probably use the wrong fighters. confirming, it worked two more times. it's one of the centus tyrans - outpost does not need to be destroyed. I did this tonight by 1st of all warping to the mission in a pod and looking around to see where the station is and if it is inline with a celestial. This was the case and so I warped to the beacon from the celestial @ 70km landing me right on station. Kill the tower and then the subsequent spawn that appears from shooting the tower. In my case I shot Dread Lord, Phantasm, Devil (<- need to check name) and Daemon. Mission completed.